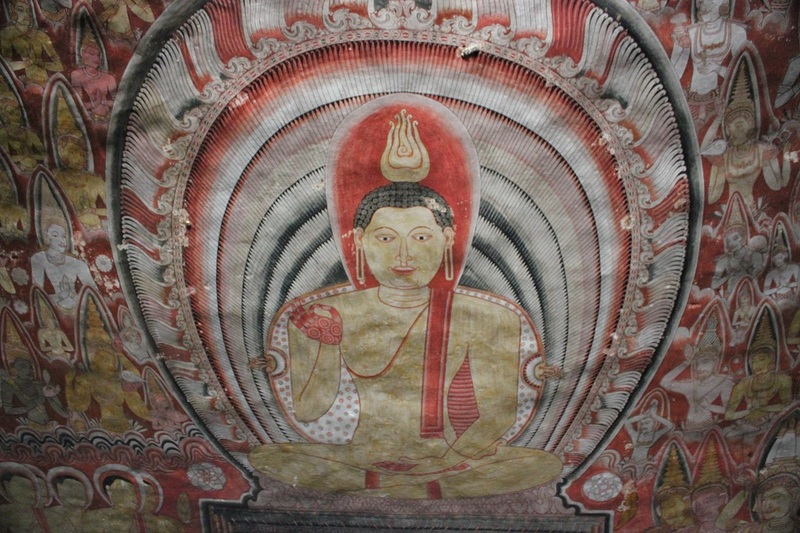 Fresco Deco of Dambulla | What an Amazing World! Suresh drives the old minivan with a constant speed, en route to Anuradhapura. It is still hours away from noon, yet I have already felt so sleepy. Suddenly Suresh talks to me while pointing his finger at a rugged landscape to my left. “The cave temple is up there,” he says. “We will go there after going back from Anuradhapura.” I nod while trying to read some shop signs on the road side to find out where we are ─ still with the sleepy eyes. Finally I manage to read some Latin words among intricate Sinhalese and Tamil letters and learn that we are somewhere near the town of Dambulla. I did not know a lot about Dambulla prior to arriving at this island nation. 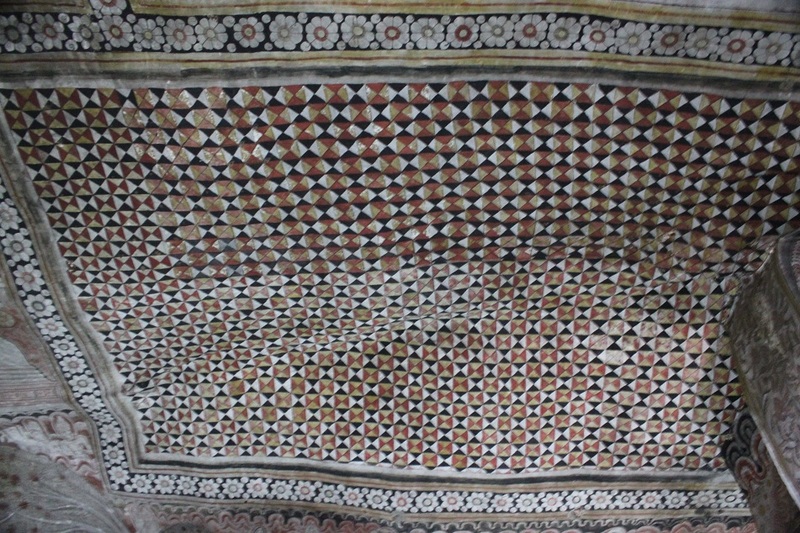 But it was a picture of the interior of the cave which I saw at a tourist information office at Colombo Fort train station that made me decide to put it in one of the places to visit during my sojourn. The images of intricate frescoes inside a seemingly very interesting cave were just too captivating. 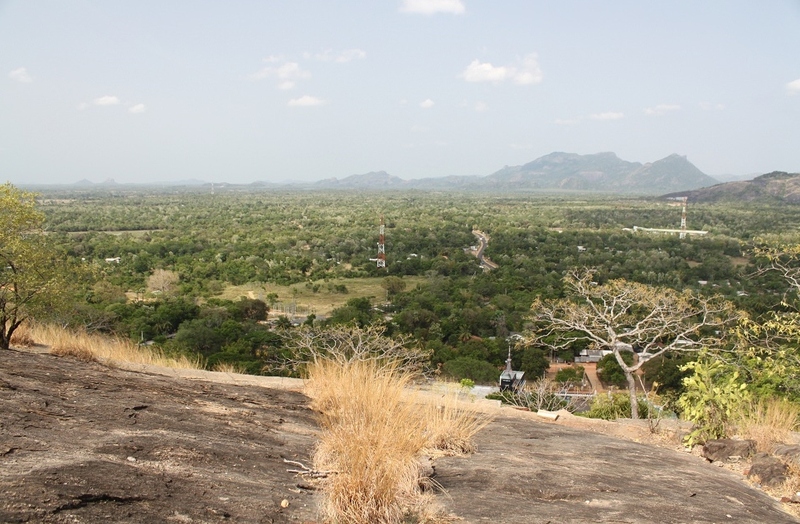 Surrounded by flat plains, the rocks of Dambulla stands sturdily amid arid landscape – the result of Sri Lanka’s scorching summer. Fortunately as it is past noon, the temperature has significantly dropped to a much more comfortable level. A giant golden Buddha statue stands tall at the base of the rocks, right above a museum – both were built a few years ago with the aid from the Japanese. To the left, a narrow passage leads to the rocks’ cap through series of steps, occasionally interspersed with cold-lava-look-alike surface where stepping up is far more challenging. To my surprise it takes a lot of energy to climb the entire stairs – at least for me. After fifteen minutes, my exhaustion turns into relief when a small building emerges from afar and the path gets flatter and easier to walk on. The wind blow carrying fresh air helps me recover fast. But it is the view of the surrounding plains which ignites my excitement. Sigiriya is easily seen from this place – an ancient site I want to go the most in Sri Lanka. 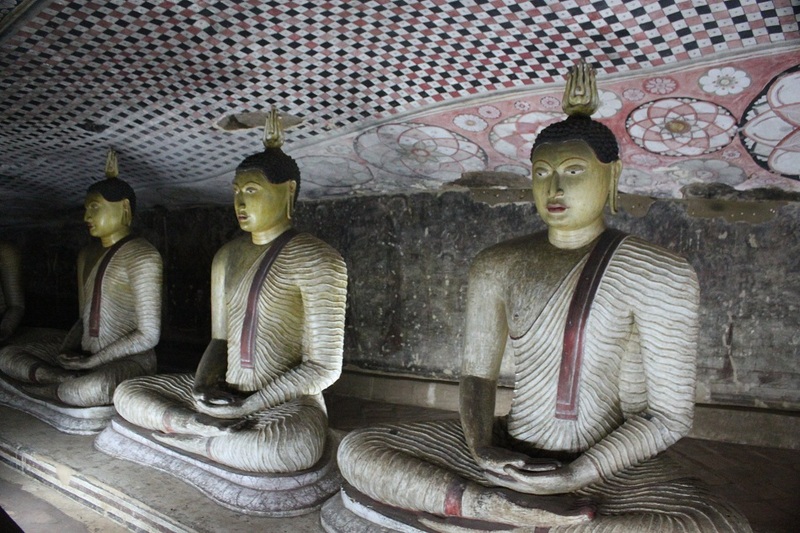 Dambulla cave temple is a compound of five caves connected to each other through a corridor seen from outside as a long white shelter incorporating many Sri Lankan architectural features. At one end, a humble monastery sits elegantly providing a serene place for people to pray. 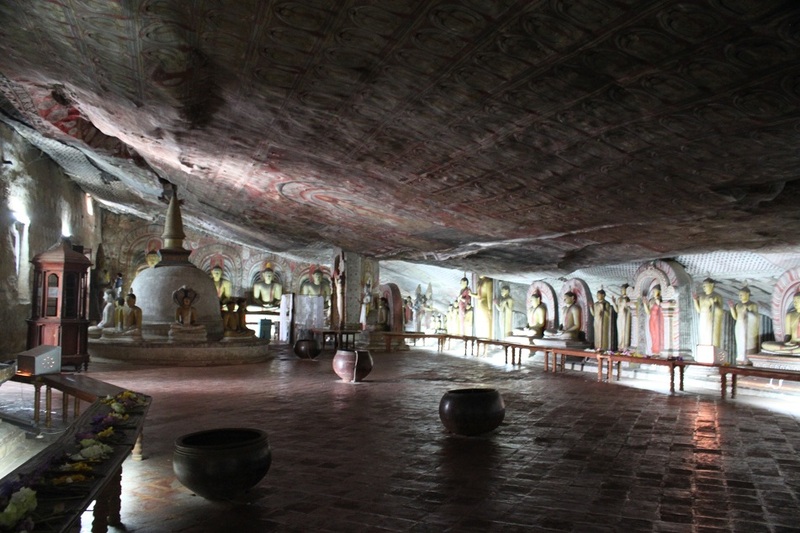 Inside the main cave, any visitor to this place would be fascinated by the intricate frescoes adorning every inch of the cave interior depicting many aspects of the Buddha’s life as well as some interesting geometrical patterns. Fresh lotus buds scattered all over, left by visitors earlier that day following countless prayers offered inside this cave. 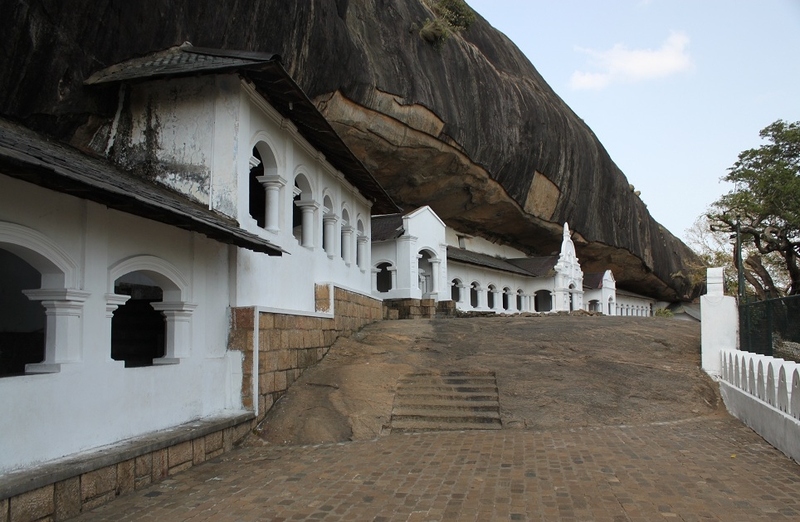 Dating back from the 1st century BC, this cave complex is said to be the best preserved in Sri Lanka. 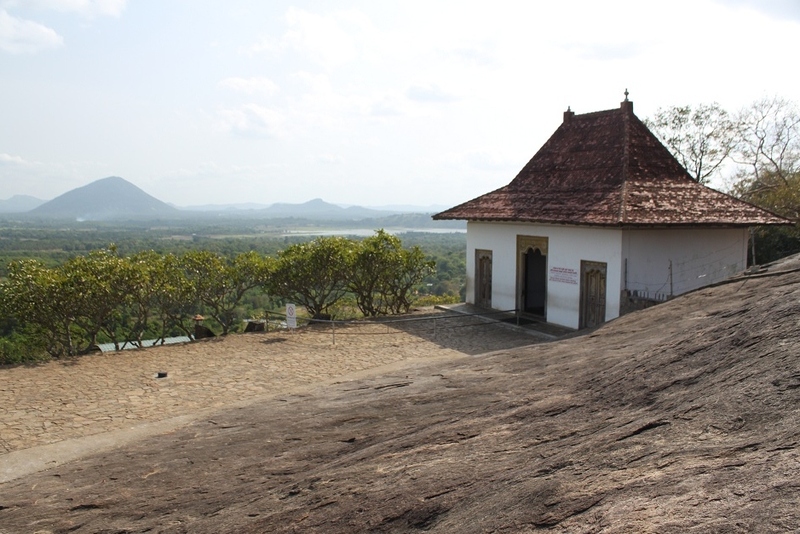 When the South Indian invaders raided Anuradhapura, King Valagambahu fled to Dambulla and resided around the rocks to later convert the caves into a temple. 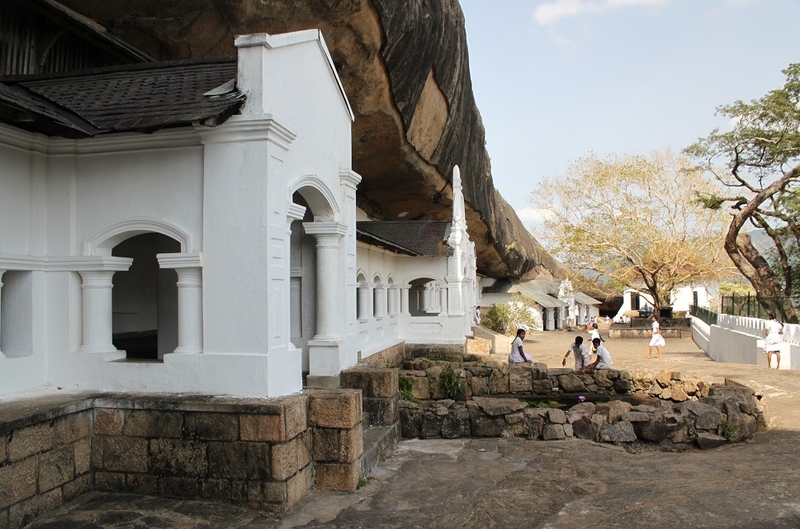 Over the years, long after the invaders had left the island, subsequent kings added more statues and maintained the cave temple as a main pilgrimage site in Sri Lanka. Taking photographs in such a dim place without using the flash and not having a tripod is a very hard thing to do. Luckily enough, I manage to snap some pictures with minimum blur inside the main cave. Several minutes later, I move to the other smaller caves which are also embellished with beautiful frescoes and countless statues to get some more photographs before concluding my short jaunt to this compact cave compound. Outside the cave, a small group of schoolchildren in white uniform are playing around, giving this quiet place a rather cheerful ambiance, while some older people are taking a break under a tree. Walking down on the same path where I went up earlier that afternoon, I feel the wind blows even more strongly than before, pushing me forward and backward depending on its own will. 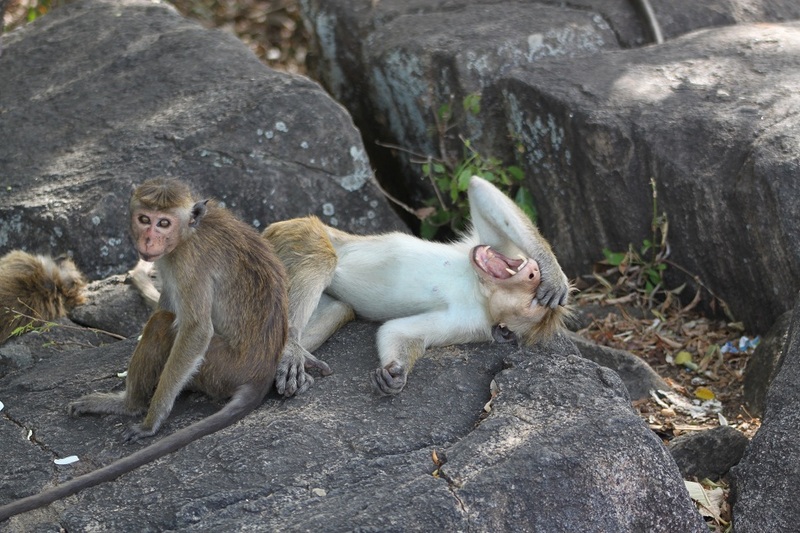 Under some leafy trees, a small number of monkeys with funny hairstyle are laying down on rocks, looking indifferent of people around and more interested in taking a nap. 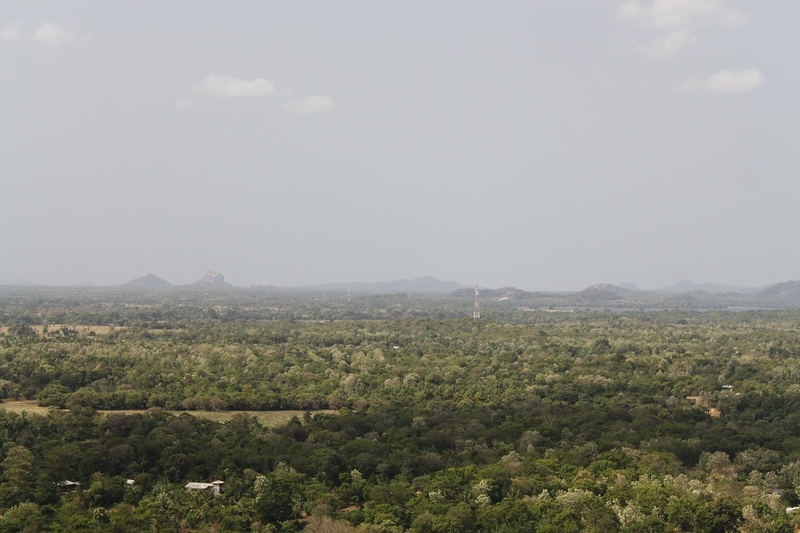 Before leaving this place, I take another look at Sigiriya – looking very impressive even from more than 10 km away. Dambulla looks like such a peaceful retreat – it’s great that you managed to visit when there was no one else inside the caves. Love the monkey shot too, their faces are just so expressive! Judging by how many lotus buds scattered inside the main cave, I must say that I was lucky enough to avoid large crowds of pilgrims. For the monkey, I wish I had a good picture of their hair. Funny monkeys they were. I think they are bonnet macaques. Oh thanks for the info! I’ve been looking for the name but couldn’t find it. Btw thanks also for the reblog! Another wonderful place in Sri Lanka! I am really enjoying these posts. Haha the sleepy monkey is funny!! Btw, how long was ur Sri Lanka trip? I spent eight days in the country. Most of them around the Cultural Triangle. Thanks for dropping by! When they’re not mischievous, monkeys can be pretty cute. I often think of what they might be thinking when they do certain thing, like the ones at Dambulla. I know this place is supposed to be amazing.Your photos of the temple under the rock left me in awe. It’s much more amazing that I imagined. What a special place. You’ll be surprised by how many great places this one island has! Am I wrong to say that the monkeys should have more portion in your post? They are funny – but scary at the same time. Judging from your posts, Sri Lanka looks promising to be visited. I feel like it transmits different vibe as a destination. Sri Lanka is indeed a destination in and of itself. About the monkeys, you’re right. They’re both mischievous and funny. I know! As if painting on flat surface was not hard enough. 🙂 Actually you will pass through Dambulla on the way to Sigiriya from Kandy, very convenient.